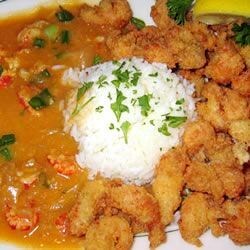 "I'm from Louisiana so that means this is a true recipe for Crawfish Etouffe. My family loves it when I make this recipe! If you can find crawfish fat use it instead of the tomato paste. I hope you enjoy it as much as we do." Heat oil and butter in a large skillet over medium high heat. Stir in onion, green onion, green pepper and celery; cook until transparent. Mix in crawfish and tomato paste; cook for 10 minutes. Pour chicken broth into skillet. In a small bowl, dissolve cornstarch in water. Stir dissolved cornstarch into crawfish mixture and cook until thickened, about 35 minutes. So darn good! I have to admit that I used shrimp instead, as I can't get crawfish in Salem at present. It's still EXCELLENT. My son loved it, too.